Every week we pull together some great Canadian recipes from Canadian food bloggers around the web featuring one main ingredient or dish. This week, we are all about reducing the holiday frazzle with 13 make-ahead brunches that range from airy soufflés to gooey cranberry buns. The next morning, oh, the next morning. After all that food and booze, it's not easy to get creative so leftovers tend to take centre stage on most tables during holiday brunches. However, you are probably already spending most of the previous day in the kitchen, so why not think (and cook) ahead of time, leave some French toasts or holiday oatmeal halfway made and wow your guests the on next day? Here are some delicious, sweet and savoury, and easy-to-make recipes that will allow you to stay a little longer in bed and spend more time opening presents with your loved ones. These [Twice Baked Goat Cheese Souffles](http://bethdunham.ca/updatesnews/2015/8/13/twice-baked-goat-cheese-souflee) can be made ahead of time and popped into the oven when company comes for brunch. Definitely lots of wow factor without any last minute fussing. From **Beth Dunham**. These [Cranberry White Chocolate Breakfast Buns](http://www.crumbtopbaking.com/cranberry-white-chocolate-breakfast-buns/) can be baked the night before and left in the skillet overnight or you can make the dough the night before and even arrange the buns in the skillet, cover and refrigerate overnight and bake in the morning. They will remind you of a cozy, snowy Christmas morning! From **Crumb Top Baking**. 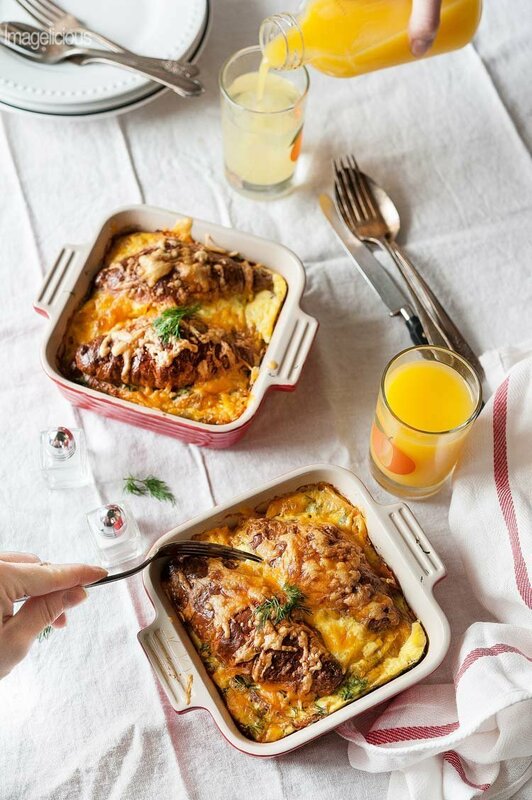 This [Smoked Salmon Croissant Strata](https://www.imagelicious.com/blog/smoked-salmon-croissant-strata) is the perfect brunch dish to make during holidays. It is elegant, savoury and a little bit indulgent. Plus, it has to be prepared a night before, thus removing the stress of last minute cooking. From **Imagelicious**. Preparing this [Raspberry-coconut Cream Stuffed French Toast](http://www.fridaycakenight.com/2014/12/raspberry-coconut-stuffed-french-toast/) the night before leaves you plenty of time in the morning to relax and enjoy the holiday company. Besides, it is as delicious as it sounds! In the middle lies a luscious layer of coconut cream, cream cheese, and flakes of coconut. And the whole thing is topped with fresh or frozen raspberries. From **Friday Is Cake Night**. This [Apple Crisp French Toast Casserole](https://bakeeatrepeat.ca/apple-crisp-french-toast-casserole-recipe/) is a casserole that tastes like French toast. And apple crisp. It’s basically dessert for breakfast that you can make ahead of time and therefore have no fuss at all on Christmas morning! From **Bake.Eat.Repeat**. With this [Maple and Cranberry Granola Muffins](http://foodnouveau.com/recipes/breakfast-brunch/maple-cranberry-granola-muffins/) recipe, you'll get a festive, make-ahead muffin perfect as part of a holiday brunch spread, or as a snack, or even a dessert, drizzled with maple butter. Besides, anything with cranberries in it feels especially festive, don’t you think? From **Food Nouveau**. This [Apple Cinnamon French Toast Bake](http://thebusybaker.ca/apple-cinnamon-french-toast-bake/) is perfect for lazy mornings. It can be made the night before and baked in the morning for a fresh breakfast. It is delicious with yogurt and maple syrup, but you can also take it up a notch with whipped cream and maple syrup or even caramel sauce! From **The Busy Baker**. These [Easy Slow Cooker Breakfast Potatoes ](https://thecookiewriter.com/easy-slow-cooker-breakfast-potatoes/)can be prepped the night before and allow you to awaken to the aroma of deliciously cooked potatoes. From **The Cookie Writer**. These [Baked Breakfast Egg Cups](http://thefoodblog.net/baked-breakfast-egg-cups/) are perfect for a make ahead, easy breakfast on the go. You get your bacon and eggs, along with some veggies, too. They're yummy and satisfying, and they'll fill you up and keep you going until lunch. From **The Food Blog**. [Bostock](https://urbnspice.com/my-recipes/ultimate-breakfast-pastry-bostock/) is also known as the “Better Than French Toast” breakfast pastry. It is actually easier to make; an excellent make-ahead option, and is so delicious that it will become a staple on your holiday brunch menu. From **UrbnSpice**. This healthy [Sweet Potato Breakfast Casserole](https://leelalicious.com/sweet-potato-breakfast-casserole/) with eggs, bacon, spinach and more veggies is a perfect way to feed a crowd. The overnight option makes it especially appealing for the holidays. From **Leelalicious**. This [Holiday Overnight Oatmeal](http://mdivadomestica.com/2017/11/holiday-overnight-oatmeal/) can be made ahead of time, popped in the oven on Christmas morning and you can rest assured that everyone will love the tartness of the cranberries mixed with the apples, cinnamon, allspice and the pecan topping. From **MDivaDomestica**. A big thank you to all our FBC Members who participated in our making-ahead brunches roundup! If you're an FBC Member and would like to submit to future weekend link roundups, make sure you're signed up to receive your members-only newsletter where we list all the weekly roundups for the current month (don't receive your monthly member newsletter? Log in to your account and check off the box to receive our member updates!). Such a great round up! I’ll definitely be referring to this over the coming days as I prepare some holiday brunch dishes. I’m all about planning ahead and enjoying the moments with family and friends! Thanks for including my recipe for Cranberry White Chocolate Breakfast Buns! Happy Holidays!